Home / Personal and Misc / Travel and Living / What all I am packing for 34 days America trip? As you may be aware, I am on a 34 day trip across USA, Central America, South America and Canada. Past one week I've explored Washington (see Cherry blossom pics here), Baltimore, The Bahamas and now back in Florida, heading to Bogota Colombia tomorrow. Apart from what's shown in the video, I am carrying a water bottle, a pair of slippers and an umbrella. High mobility: I hate spending lots of money on taxi. If required, I am ok to walk a few kms. With a backpack alone, I will have high mobility, can start exploring right from airport, can walk a bit if required. If I take a check-in bag then dragging it all along won't be practical. 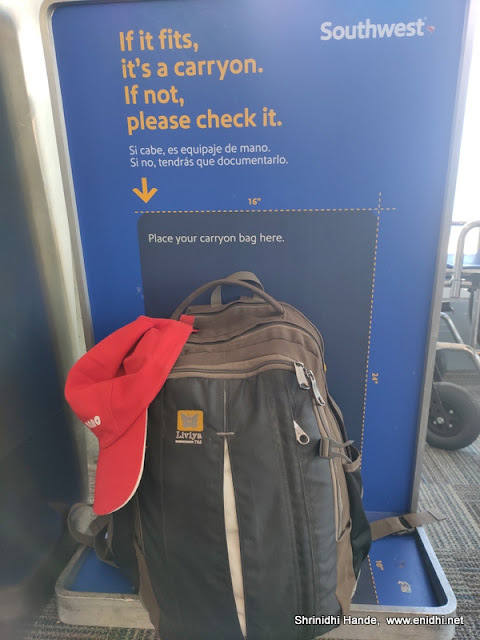 Less risk- Checked bags can get lost, delayed- with cabin bag only, my risk is minimized. How I am planning to manage with only a cabin bag for 5 week trip? Minimum Cloths: The main culprits why most of our bags swell. How much cloths do we need? Of course not possible to manage with just one or two pairs, but definitely we don't need dozens of them. I am carrying 5 sets of cloths plus one wearing- with these 6 sets, I am planning to manage for about a week and whenever time and situation permits, use laundry service, get them cleaned up and reuse. I will have to spend a few dollars on laundry but will save a lot w.r.t time, effort, money spent on taxi/check-in baggage. No DSLR: I didn't carry my Nikon on most of my trips last year- to China, New Zealand, Australia etc. It adds up to about 2 kgs with body, lens, mini tripod etc. I have been able to manage with mobile photography of late- I miss DSLR only when there's a need to zoom-in. But that trade off has been worth as I can travel light with only mobile and goPro, not having to carry Nikon on my neck. 2 kg laptop: Like DSLR, if I had avoided carrying a laptop, I would have saved about 2 kgs and also my airport security check would have been faster. But after detailed deliberation I decided to carry it. 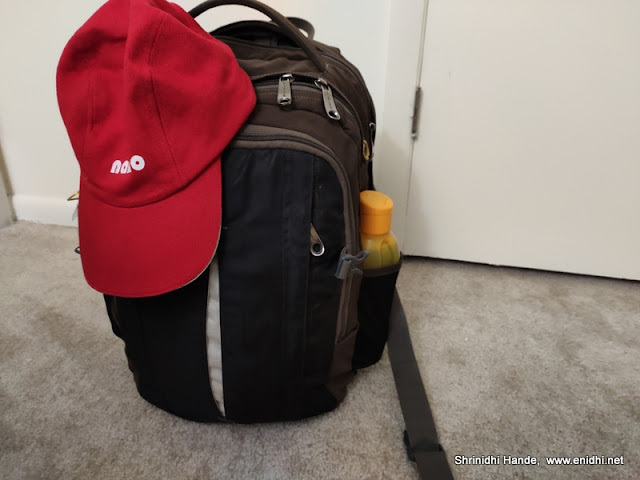 Other items are bare minimum- travel adapter, chargers, printout of important documents, a selfie-stick for gopro(could have avoided this), an umbrella, a jacket, a water bottle, a power bank and a note pad. Pickles to save cost: I am carrying some 6-7 packets of pickles, each some 60gms each. I plan to use this with rice, bread etc where possible. Many restaurants sell rice for say X dollars, curry/side dish would cost 2x to 3x dollars. With pickle and possibly curd from a supermarket, I can have my meals cheap. So far I am able to manage well. Still 4 more weeks to go. Wish me luck. Great effort.Wish you lots of luck for a successful trip. Loved all pics posted on your FB page. Amazing Shri.. do keep posting on your adventures!